A small confession: I used to work at my university library. I was 16 and I got my first proper job as a Shelver. That’s right, I put returned books on shelves. Three times a week, after school. And I adored it. 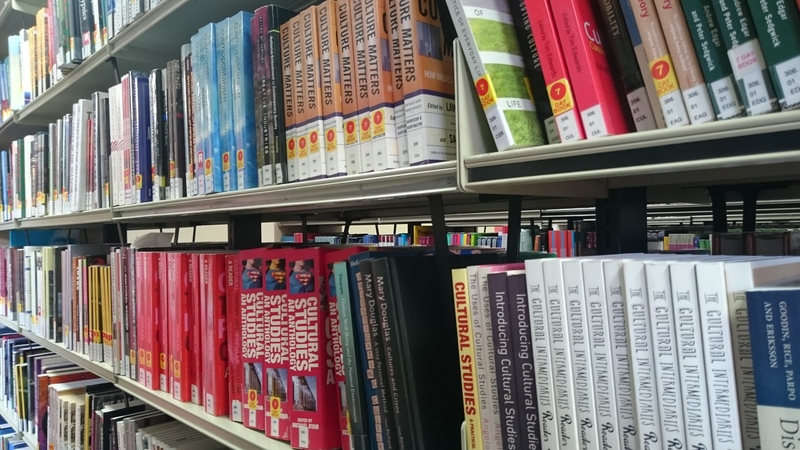 Putting things in their rightful place, helping students find elusive texts and lining the books up so that they were straight – the perfect role for someone who loves organisation! If I was a superhero my super power would be “encyclopaedic knowledge of the Dewey Decimal System”. Thus, you see, I am already pre-disposed to loving libraries. Which means I might be a little biased. However, this week I’ve discovered that – for me at least – writing in the library is best when you really want to concentrate. I had two goals. To proof read a book chapter that I’d left alone for a week to rest. And to try to bring together an article that I felt was going in too many directions (and was already well over max. word count). I found a quiet space behind the book shelves and got my manuscripts out. I saw and heard no-one. I didn’t have a computer with me, and the nearest one just connected to the library catalogue, so no checking twitter at random. Pen at the ready I worked through both documents. Finished the book chapter and got down to some serious editing of the article. This happened at a much greater speed that I expected. The intense quiet concentrated my mind. It was almost exam-like. Is it a cop out to say that different spaces are suited to different writing tasks? It feels a little weak to end on that note. But if this week has taught me anything, it’s that each writing space has a character, and you need to find the right writing goal that aligns to it. The Kitchen, which we started with, was right at that time because that’s where I was – at the start. I needed to be near familiar things, connected to my email and various documents (online and otherwise). An office away from the office. In The Cafe, I needed to be creative, decamp from the office and spin some ideas around until they broke free. The Library was right for consolidating all of that work. An oasis of and for quiet contemplation. And so to the end of this mini-series on places to write. There are absolutely loads of locations beyond kitchen, cafe and library – and I’m looking forward to trying others out in the future – but for now this has been an interesting jaunt into alternative working spaces. Thanks for joining me on this journey. I’ve really enjoyed hearing about your favourite places and loved the links to other people’s blog posts. I’ll end with Pros and Cons as always, but I’ve come to believe that we each choose the right space for the right moment. What do you think? Peace and quiet. Spaces to hide away and get your head down. Amazing staff. I couldn’t find a book when I was there. I didn’t really need it but asked a member of library staff. They could not have gone more out of their way to help me find it. Library staff are sent from heaven. Near the office, so I got to pop in, check on things generally, help out with some tricky issues and catch up with colleagues. Before and after my writing/editing session, I wandered for ages amongst the books. I couldn’t get enough of the sociology & psychology books, in particular. The feminism section was also hard to move away from. So many books! All looking so very interesting! I found myself noting down names of books that I thought my fellow PhD-ers might find interesting. I probably should have been writing. So if you’re a bit of a ‘book magpie’ like me, come ready with a plan of action or a strong will! I share your love of all things library. I am rather envious of your first job. I like writing in the library, I often do it during term time. I think sometimes it bemuses students to see me there which is a bit odd. There’s something magical about being surrounded by books.